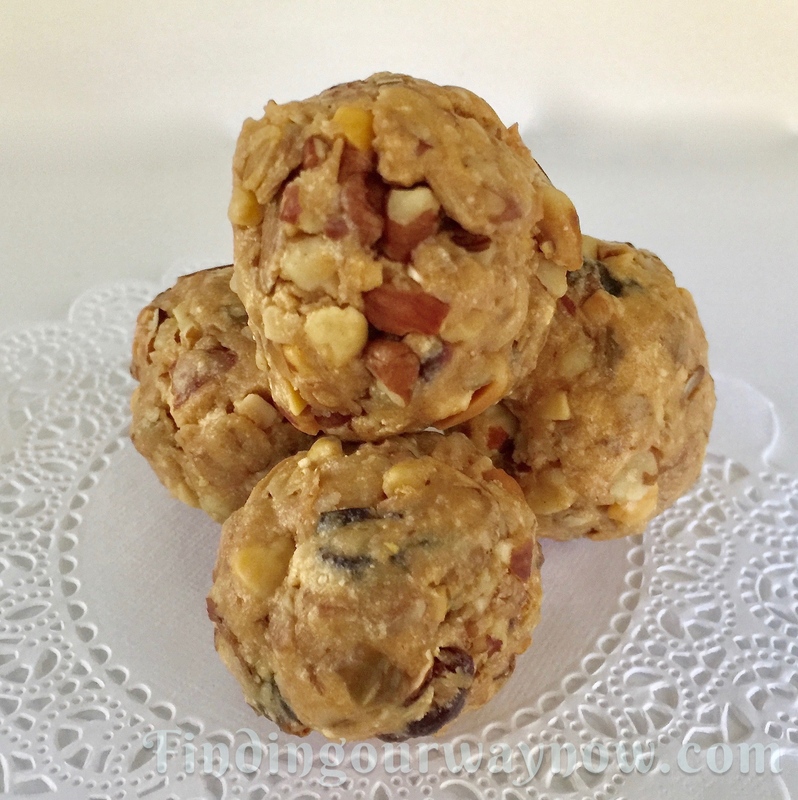 I can honestly say it doesn’t take much energy to make these gluten-free bite-sized energy balls, a very healthy treat. They’re great to pack for a pick-me-up at work, before or after a workout, for a fast breakfast on the go; heck they’re good enough as a treat at any time of day or night for any reason. Preheat oven to 350° F. Combine the multi-grain cereal, nut, and coconut and spread it evenly on a large baking sheet. Toast for 10 to 12 minutes. Stir the mixture halfway through the baking time. Allow it to cool to room temperature. In a large bowl, combine the peanut butter and honey until blended. Add the cooled toasted grain mixture and the remaining ingredients. Using a large wooden spoon, stir until everything is well mixed. The dough will be quite stiff, use a bit of muscle and take your time. Once thoroughly combined allow the dough to rest for 5 minutes. 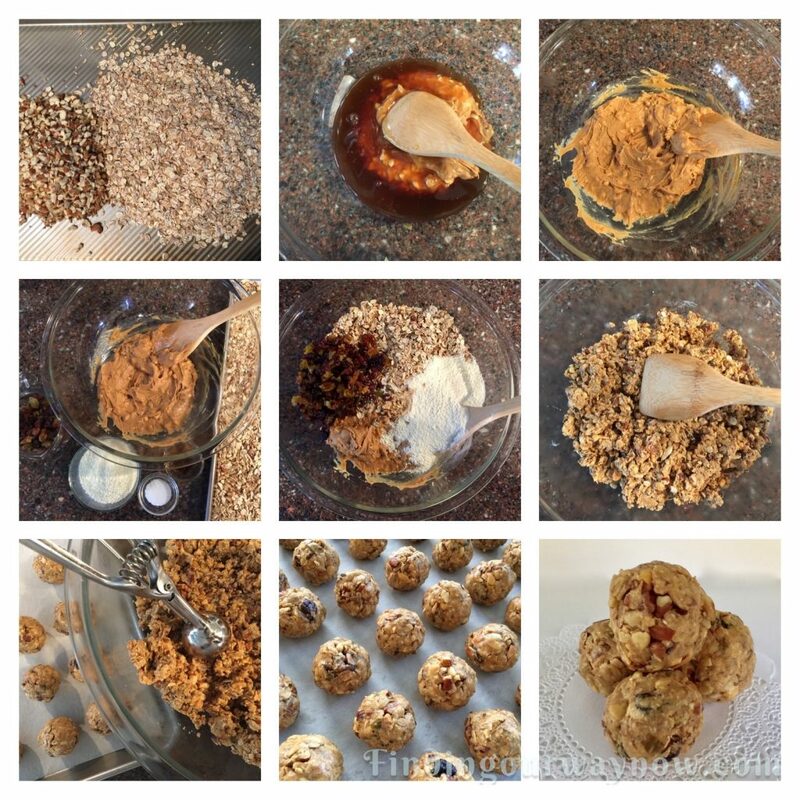 Using a tablespoon measure or cookie scoop, shape the mixture into 48 snack-sized balls. Place them on a parchment-lined baking sheet. Allow the balls to rest for 30 minutes or so before serving. Store any leftovers in an airtight container for up to a week, or you can freeze them up to six months. Notes: These will come together in a jiffy. If you can’t find a multi-grain cereal mixture, you can make your own with ¾ cups old-fashioned oats, ½ cup barley flakes, ½ cup rye flakes, and ¼ cup wheat germ; or just use all old-fashioned oats in its place. If you prefer to use creamy peanut butter instead of the crunchy, reduce the amount from 1¾ cups to 1⅓ cups. If you prefer another type of nut butter, have at it; remember to use more for the crunchy variety and less for the smooth. The types of dried fruits are entirely up to you. The variations that you can use are endless. If you’d like to convert these balls to bars, press the mixture firmly into a 9-inch square cake pan. Let rest for an hour. Invert and cut into the size bars you desire. Suggested Add-in Opportunities: The additions below can be replaced or as a complement to the nuts, dried fruit, and coconut but DO NOT exceed the total of 2 ¼ cups. What do you think? Will you give these Fruit, Nut & Grain Energy Balls a try? If you do, I think you’ll find them quite addictive much like my Breakfast Cookies.